Kapamilya stars Angel Locsin and Jericho Rosales actively participate in rescue operations for flooded victims in Metro Manila. As the relentless monsoon rains flooded different parts of Metro Manila for the past two days, celebrities expressed their concern over Habagat victims via the photo-sharing site, Instagram. As early as around 6 a.m. today, August 20, It’s Showtime host Kim Atienza drove around various streets in Manila and started posting areas that are highly affected by floods including Vito Cruz, Nakpil, Taft, and Quirino Avenue. Such a nice gesture on his part was probably a big help to motorists who are planning to pass by the area and might end up stranded. Angel Locsin, who has consistently participated in Red Cross typhoon rescue and relief operations in the past few years, once again volunteered in extending help to flood-battered residents in the metro. Aside from responding to her Twitter followers’ flood reports and call for rescue, Angel later posted on Instagram a photo of her boot-clad feet resting on top of her car’s dashboard, looking as if she’s all set for a rescue operation. 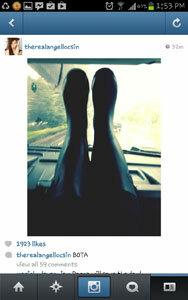 She merely captioned it with “bota,” but many of her followers assumed that she’s on her way to help flooded victims. Jericho Rosales also joined as a rescue volunteer in Marikina. 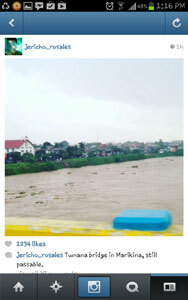 Earlier today, he also posted a video of Tumana Bridge in Marikina to assure residents that it’s still possible. In one of his replies to an Instagram follower, Jericho humbly stated, “@ianlorenos nakaka-excite lang mag4x4 with a purpose,” referring to his admirable volunteer work amidst the habagat rains. On the other hand, other celebrities like KC Concepcion, Anne Curtis, and Luis Manzano also expressed their concern for habagat victims as they help spread information about emergency hotlines for rescue and relief operations or donations via their respective Instagram accounts.